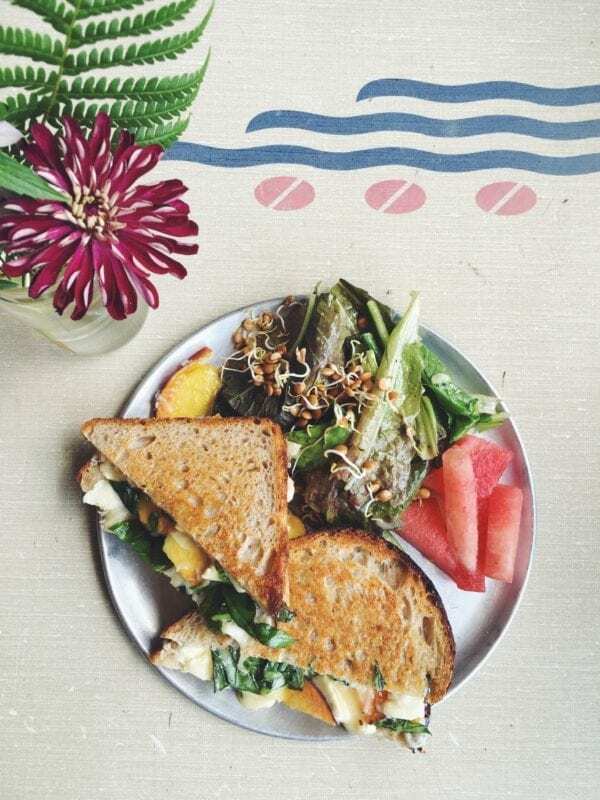 You are here: Home / Recipes / Grilled Cheese Recipes / Looking for Florida’s Best Grilled Cheese Sandwiches? Look No More! 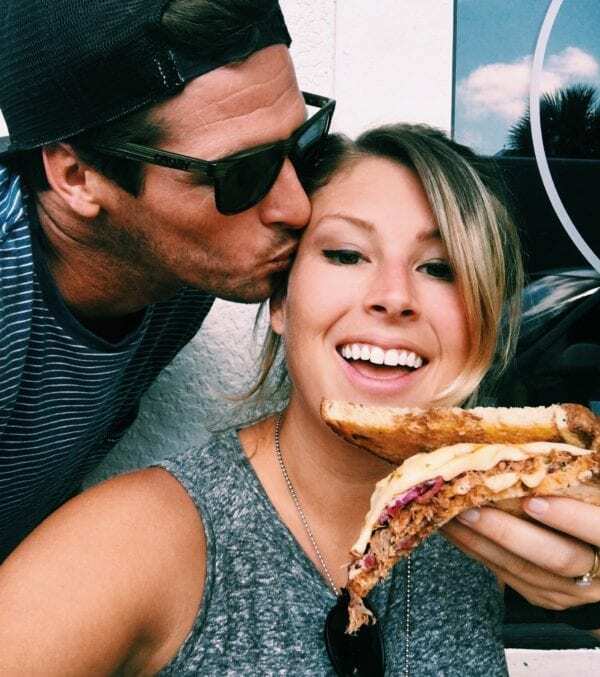 Last week, the bf and I headed out on a 3 day road trip all around the sunshine state to hunt down the best grilled cheese sandwiches in Florida. After spending too many a few hours online, I became overwhelmed by all the grilled cheese goodness that our beautiful state had to offer. So I did what any blogger girl with 34,000 followers would do and went straight to social media for a little help. After receiving dozens of awesome and unexpected recommendations, Jerm and I compiled our master list, packed our bathing suits (and stretchy shorts), filled up the ole’ Subaru, and headed South to get our cheese on. Oh oh, and before we begin on this delicious adventure – Please keep in mind that this list is not ordered from best to worst or anything like that. In fact, it’s listed in the order in which we completed our food tour in hopes that you can one day repeat the #FLgrilledcheeseTour if you dare! TBH, I tried to rank them but that sort of hurt my heart. It felt like I was a mom and I had to choose one child over the other or something like that and I just couldn’t. But alas, if you must know which ones reigned supreme, keep reading and I’ll fill you in on our favorites. Our adventure started at Backwater in downtown Melbourne Beach, Florida. This cutesy old-Florida inspired restaurant is known for their super fun DIY pancake tables, but from my perspective, this is the second most exciting thing happening here. 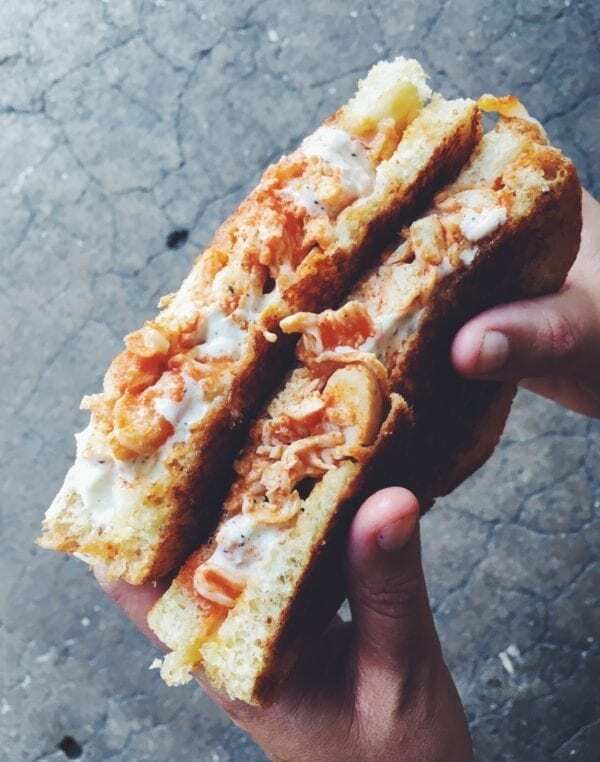 Once you get a little bite of their deep fried Bourbon Revival grilled cheese, you will probably want to find me and kiss me (or Jerm.. or both?) on the lips because it is THAT good. 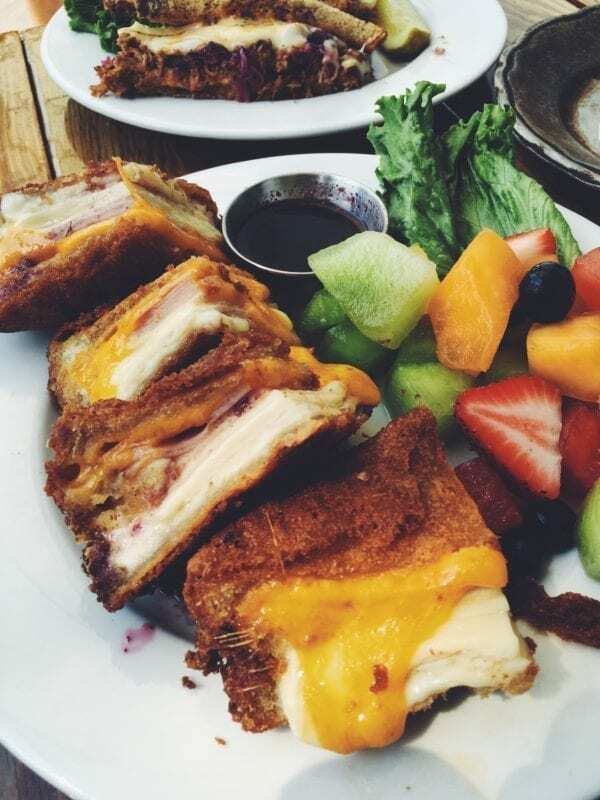 Stacked high with piping hot layers of melted swiss, turkey, ham, and cheddar, this spin on a Monte Cristo is deep fried in the crunchiest beer batter around and is served with a sweet bourbon melba dipping sauce that is oh-so-good. Don’t mind me though, I’ll just be here, drooling over my memories. As we headed down the coast a little more, we stopped at The Grilled Cheese Gallery in West Palm Beach. 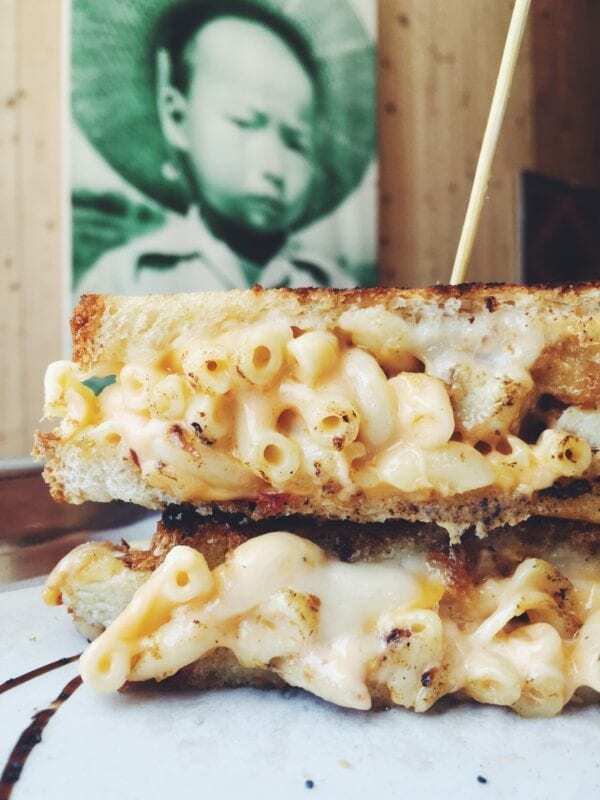 As you might know from following my recipes, I have a slight obsession with grilled mac and cheese sandwiches so I was super stoked to see that they were adding this gem to the menu! 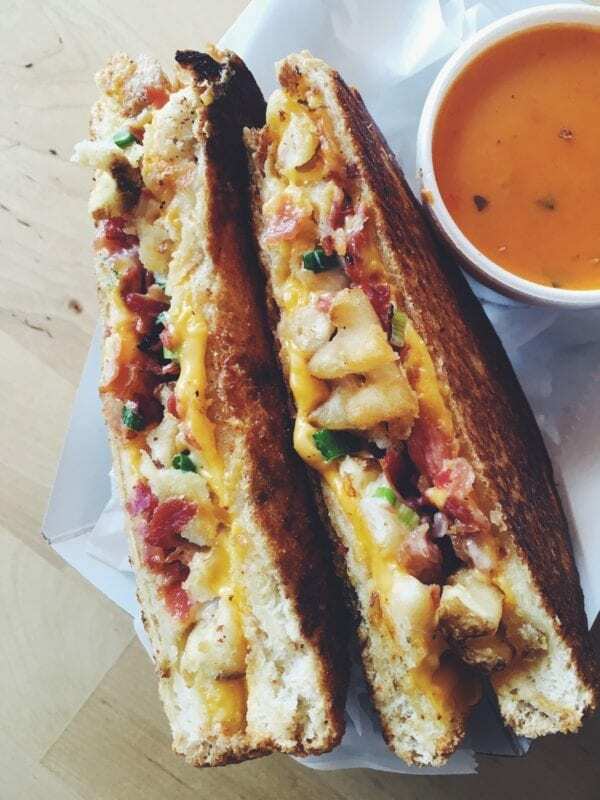 Packed full of nutty gruyere, creamy mac n cheese, crispy chunks of salty fried chicken, and a perfectly spicy chipotle aioli, this Southern grilled cheese encompassed everything that I identify with. Is it my spirit grilled cheese? Um, definitely. After a few more ~awesome~ dance songs on Jeremy’s playlist, we arrived at Melt Crafted Grilled Cheese in Boynton Beach. This place was sort of like the Mellow Mushroom of the grilled cheese world. The walls were lined with paintings of oozy drippy cheese, mythical wizards, and magical beings and they had about a million of variations of this childhood classic. After nearly having a panic attack while trying to decide which one would be the tastiest, Jerm calmed me down and recommended that we get the loaded potato grilled cheese because it sounded super dreamy. Their perfectly buttery grilled country white bread was packed full of melted American cheese, crispy waffle fries, crumbled bacon, scallions, and ranch dressing. 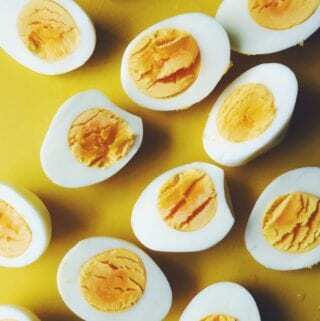 You’re hungry now, right? Oh and if you’ve got kids, bring ’em along! This spot offers free grilled cheese for all little ones from 4-9PM every single day! After another 45 minutes of being way too full and wanting to take my seatbelt off, we arrived at New York Grilled Cheese’s location in Wilton Manors (right above Fort Lauderdale). NYGC automatically had a special place in my heart because of my time spent in the Big Apple and it was where I birthed this website. I couldn’t not represent my ole stomping grounds so I ordered the Brooklyn Porkster which was the freakin’ bomb.com. 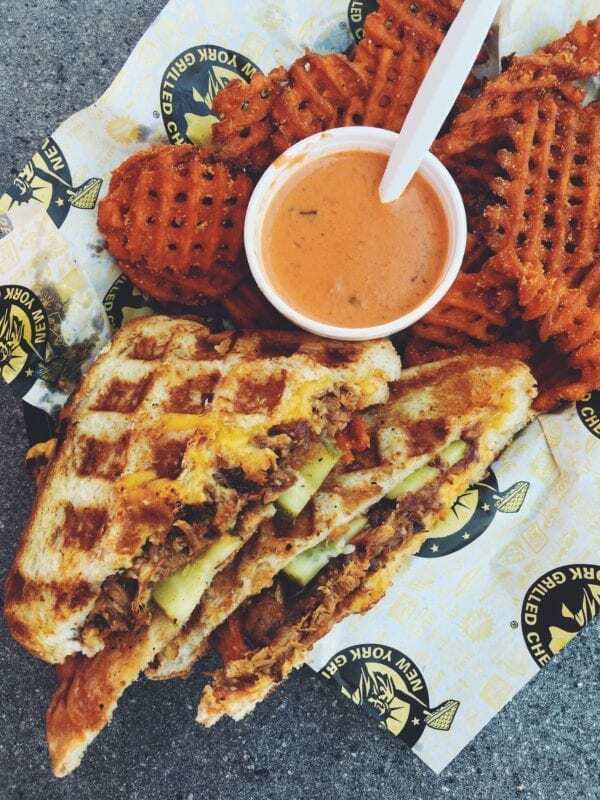 Two thick slices of country white bread stuffed full of slow roasted barbecue pulled pork, cheddar and American cheese, crunchy dill pickles and sweet and savory caramelized onions is then waffled into grilled cheese perfection. Not only were the flavors perfect, but eating an NYC GC in Florida felt completely serendipitous. Also, you must remember this if you go – do yourself a favor and get the sweet potato waffle fries with marshmallow dipping sauce. It was truly genius and it changed our lives forever. A little later on, we finally made it to the Southernmost point on our tour – Miami! This food truck turned brick and mortar was perfect. And here I go again with the full disclosure bit but Ms. Cheezious was Jerm’s favorite grilled cheese. Not sure that it was the grilled cheese itself or the fact that walking tacos are his favorite food but whatever the case, Ms. Cheezious’s grilled cheese creations were awesome. This GC was loaded with their very own house made chili, American cheese, jalapeños, onions and fritos. It was all perfectly grilled together between two slices of ultra crispy sourdough and it stayed completely intact until the very last bite. It def fits my criteria for being a perfect sandwich and for that, you must go try one. After Miami, we headed up and across the state to Sarasota where we visited one of the Tom + Chee locations. 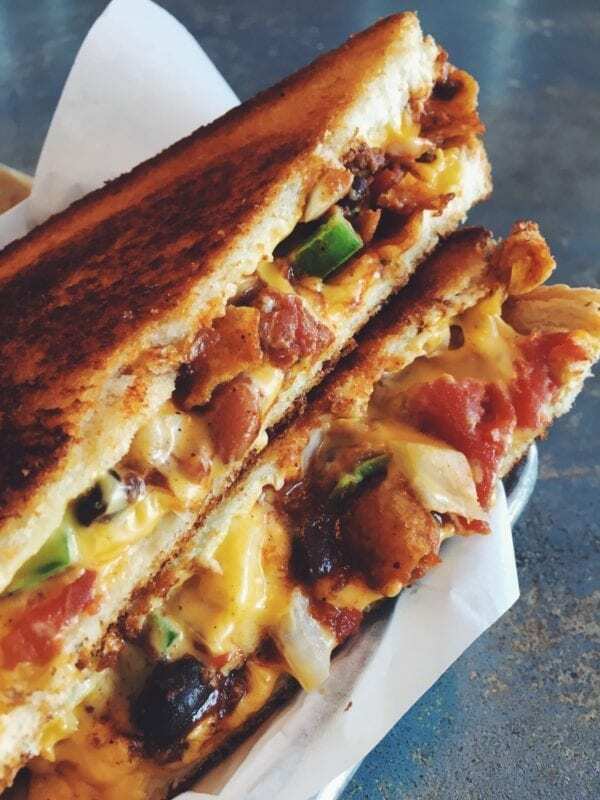 You might have seen this grilled cheese empire on Shark Tank a few years ago and let me assure you, they’re doing it right! There’s a little something for everyone and this strawberry lemonade donut grilled cheese had my name all over it. 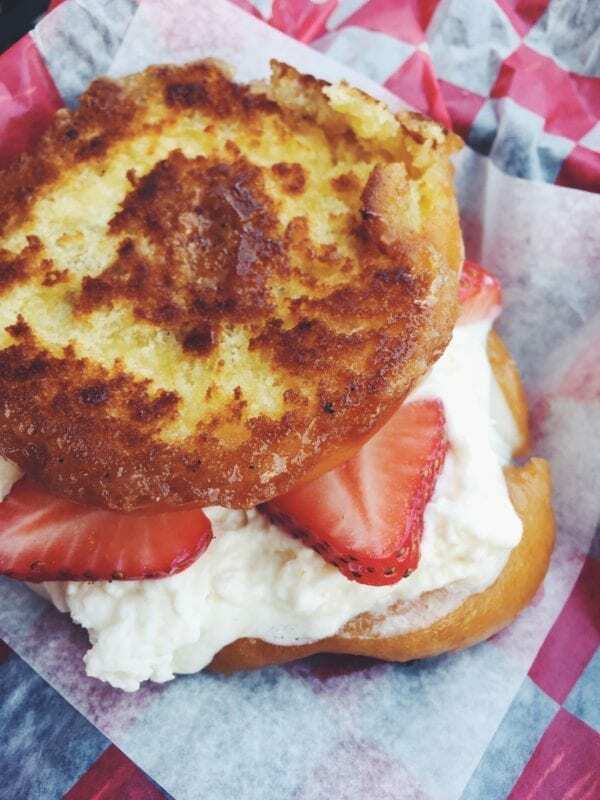 Instead of regular bread, this sandwich is made with an inside out donut and filled with fresh cut strawberries, candied lemon peel, mozzarella and mascarpone cheese. It was like the unicorn of grilled cheese desserts and I think you should all treat yo’self to one (or 80) or however many makes you feel good about yourself. Later on after we hit the Tom + Chee chain, I wanted to get a little more local so we headed to Pom Pom’s in St. Pete (there’s also one in Orlando!) 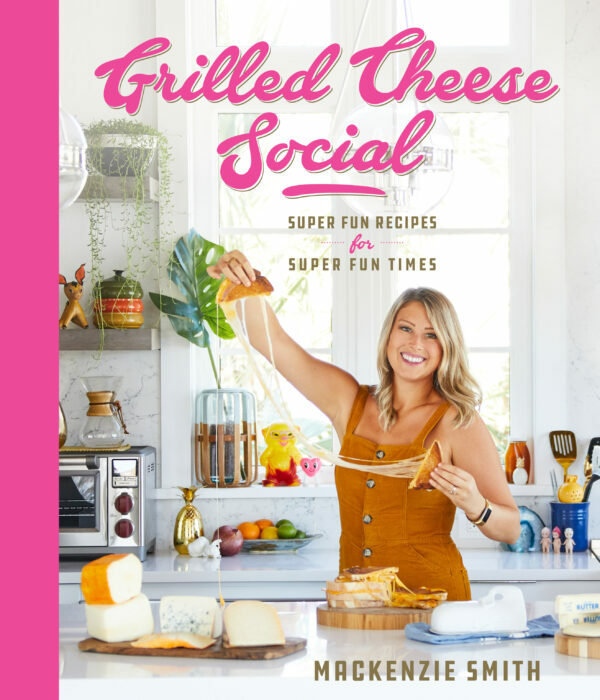 for their uber fun fusion grilled cheese sandwiches. 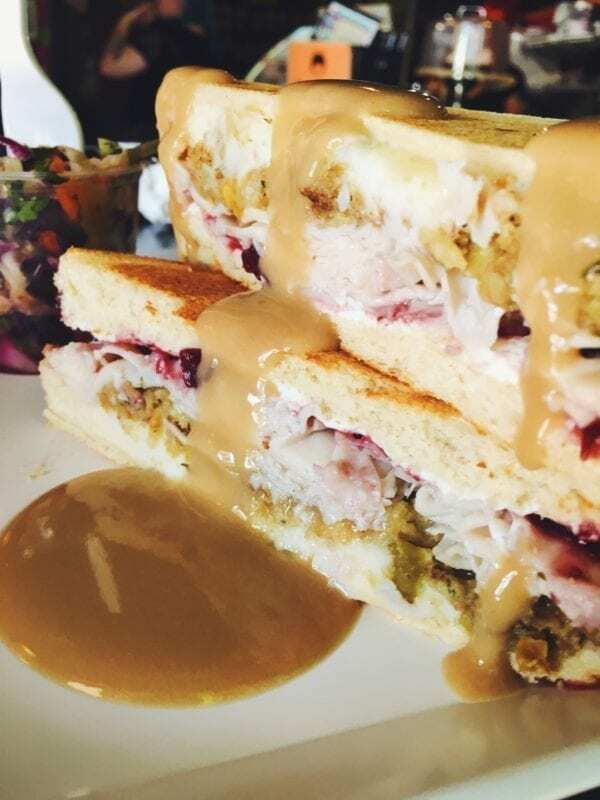 I was instantly attracted to Mama Ling Ling’s Thanksgiving grilled cheese, which was stacked high with gouda, cream cheese, turkey, mashed potatoes, stuffing, ginger cranberry chutney and a side of gravy for good measure of course. You might have even seen that ridiculous gravy drip video that I posted on Instagram… if not, you need to click here and see it right now. You also need to get in your car, drive to a Pom Pom’s, order this sandwich, and lick your plate clean. We then headed East towards Orlando to try Toasted, which was one of the most mentioned places when I asked on social media. I was in the mood for something spicy and since I had heard such wonderful things about their buffalo chicken grilled cheese, I ordered it right away. The rumors were true, this GC was packed full of creamy spicy goodness that was definitely a winner. I especially liked the use of Muenster cheese, as it’s my personal favorite melting cheese. It’s rich, buttery, and melts like heaven – making it the perfect balance to the spicy buffalo chicken component. Oh, and I’m still dreaming about the ranch dressing if that gives you any insight to how spot-on the tastes were. Definitely loved this sandwich and would highly recommend it. 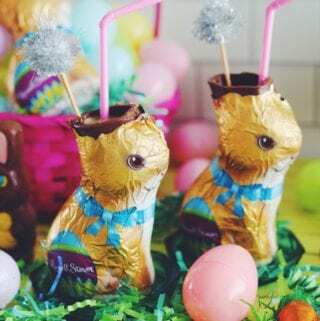 If you want to make one at home, you can click [HERE] to get my recipe. After we conquered Central Florida, we drove North to Jacksonville to continue our #FLgrilledcheeseTour. Our first stop was at Community Loaves, which is a super cute bakery that uses all the righteously good stuff they can find. And not that the other sandwiches weren’t amazing, but this grilled cheese was my absolute favorite! Eeeeeee! Made on their very own freshly baked sourdough bread and paired with Sweet Grass Dairy’s green hill cheese from Georgia, local peaches and fresh basil. 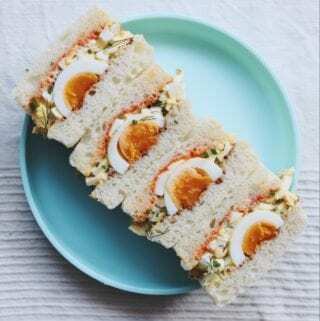 This sandwich was rich, creamy, crunchy, sweet, and savory and most importantly fresh. I don’t know why I didn’t buy all the bread that they had because I would do anything to have another one right now. Honestly, eating this sandwich was like a beautiful dream come true. We then ended our tour in downtown Jacksonville at The Happy Grilled Cheese food truck. We were greeted by their lovely and smart staff and a few of their awesome menu items. I absolutely loved their fancy schmancy grilled cheese, pulled pork mac n cheese, housemate potato chips and most of all the s’mores grilled cheese! 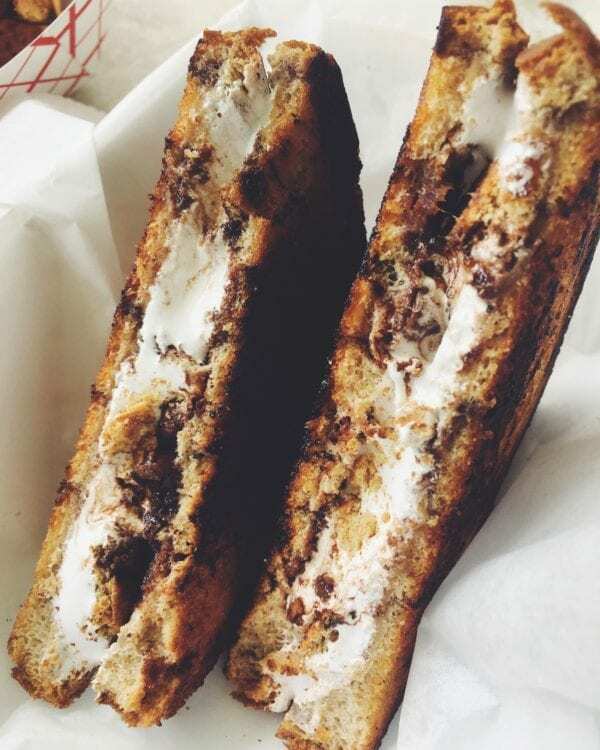 Loaded with marshmallow fluff, graham crackers, and chocolate, this sweet treat was the perfect ending to our #FLgrilledcheeseTour. After all, what kind of food tour would this be if it didn’t end on a sweet note?! Also, for the sake of nepotism, I must include one of my own creations on the list because I think I know a thing or two after all these years of blogging about my grilled cheese recipes. This is one of my favorite breakfast grilled cheese to make and the recipe is right [HERE] so you can make it yourself! 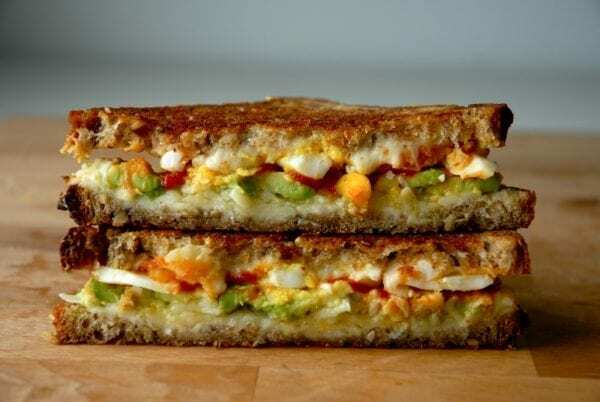 It’s loaded with scrambled eggs, Wisconsin cheese, avocado and Sriracha between two perfect slices of wheat bread. I make it at Black Dolphin Inn on the reg so you should probably get over here so we can share one and talk about cheese and life and stuff.